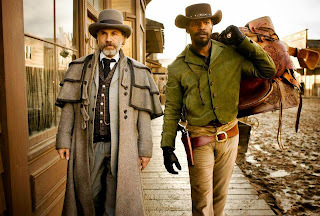 "Django Unchained" is an exhilarating experience from beginning to end. From the moment Dr. King Schultz (Oscar winner Christoph Waltz) appears, he owns the screen with his calm, cool demeanor and whip-smart intellect. This is a man that knows exactly who he is, what he wants, and how to get it. 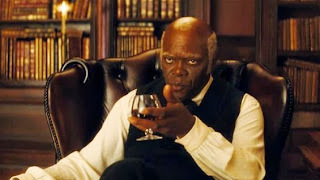 And what he wants, as the movie begins, is a slave: Django (Jamie Foxx), to be specific. Two years before the American Civil War, slavery is big business. It's a booming industry monetarily. Morally, it's an institution so deeply engrained in everyone's mindset that it's never considered a matter of right and wrong. Owning slaves isn't seen as evil or unjust – it's just the way things are. If King Schultz wants a piece of the pie, well, that would be nothing out of the ordinary for the times he lives in. But, as it turns out, the good German wants to free Django. Upon hearing the name of Django's wife, Schultz recounts the German legend of Broomhilda and Siegfried – which, as you might expect, foreshadows the events of the film quite nicely. They meet an interesting cast of characters along the way – literally, because King Schultz tells Django at one point to play a "character." It's a clever scene – one of many that paints Schultz as the smartest man in every situation. Fortunately, Django is a quick learner himself. A slave-owner known as "Big Daddy" (Don Johnson) is first on their list. Johnson plays the role with racist relish, sporting a gleeful sparkle in his eye. If he wasn't so hateful, he'd be almost likeable. It's a great piece of work by the former "Miami Vice" icon. He seizes the opportunity and gives it everything he has. Later on, they make their way over to another plantation – ironically called "Candyland." But there's nothing sweet about what Calvin Candie (Leonardo DiCaprio) has to offer: imprisoned, abused slaves. Candie's racism is just like his teeth: rotten to the core. 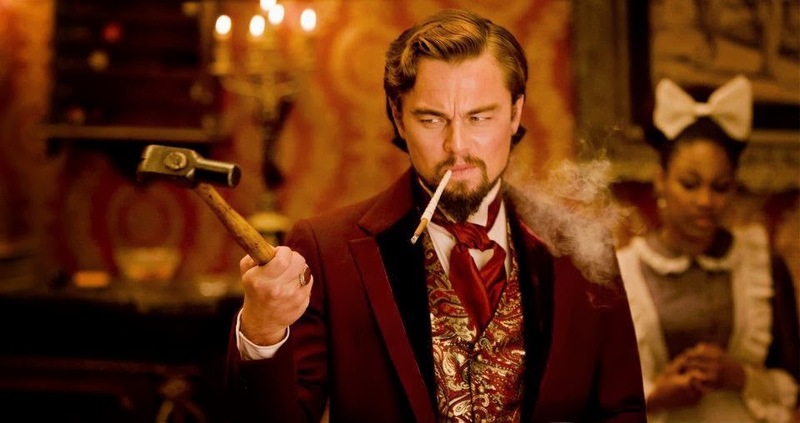 DiCaprio combines charm with malice, mixing both together in equal measure to create a truly unsettling character. Candie is assisted by his devoted house servant, Stephen (Samuel L. Jackson), who is fiercely loyal to his "master" and unapologetically keeps the other slaves in line. Jackson is often accused of playing every role the same way, but that's certainly not the case here. The white-haired, wild-eyed Stephen is like no other character he has ever portrayed. He makes Morgan Freeman's meek chauffeur in "Driving Miss Daisy" seem like a radical – at least on the surface. Throughout the film, everyone has a startled reaction to the freed Django (who is eventually given the last name of Freeman – any relation to Morgan?) and his equal treatment at the hands of Dr. King Schultz. However, green trumps black every time – as in the color of money. Jamie Foxx handles all facets of his character perfectly. Will Smith was originally slated to play Django, but it's impossible to imagine anyone but Foxx in the role. His Django carries with him an anger bubbling under the surface that seems true-to-life. As talented as Smith is, I can't see him handling this essential characteristic as well as Foxx did. It goes without saying that slavery is a controversial topic – and "Django Unchained" doesn't shy away from its worst aspects, some of which are jaw-dropping. Yet, at the same time, the film is undeniably entertaining. That's bound to be a troubling juxtaposition for some. Spike Lee wasn't shy about expressing his displeasure on Twitter: "American Slavery Was Not A Sergio Leone Spaghetti Western.It Was A Holocaust.My Ancestors Are Slaves.Stolen From Africa.I Will Honor Them." It's hard to argue against Spike. His feelings are perfectly justified. However, in Quentin Tarantino's defense, there is more than one way to approach the same topic. We've all been exposed to numerous "serious" treatments of slavery through history books, television, and film. "Django" casts those atrocities in a different light. Yes, it's a "fun" movie. But you can still enjoy something and learn from it. That, in some ways, seems like the most effective teaching method of all. No, this technically isn't history – these people never actually existed – but the realities of slavery are still very much present in "Django Unchained."